An Interstellar Rift starting guide trying to show you how to start the game (or restart if you lost all you had), giving you a taste of the different ingame mechanics available. Whatever faction you may have (already) choosen is ok. 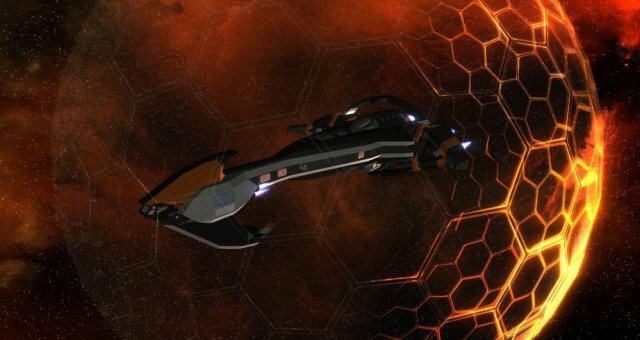 I personally prefer Hurles as it allows for a quicker startup (IMHO), as their starter ship allows you to do some mining, as well as the starting station. The starting station also comes with refineries, wich allows you to get base resources easily whenever you need them. More on that later. You lost your (only) ship, have no resources on hand to build another one and not in a mining/refining station? At first glance it may seems your game is over, but there is alway a solution. Last possibility I see (there may be other ones I don't know about) is to get a loan from your starting station and buy another starter ship. Now, either because you just started or because you lost all you had, let's explain how to begin (again?) in the game. Interstellar Rift (IR for short) is an open-world(s?) sandbox game. There is no final objective, and hopefully more than a way to achieve those you came up with. But basically, you will need minerals, and there's more than a way to get your hands on some. Let's describe them first. Iron: if you have some iron ore, you're a refining process away from getting iron bars. Most used and plentiful ore in IR. Water: H2O. You can process it into hydrogen for fuel or oxygen to breathe. You can also extract a few deuterium (hydrogen isotope) for more advanced uses or some good bucks. More on that later. Copper: second most used ore to be used after refining. Steel: A good mix between Iron and Carbon. Silicon: you don't need some for now, trust me. We'll get some (very few) in the section "Combat". The basic materials are all you need to make a basic, working ship. But how to get some? There is multiple way to get them, and the most used are: trading, mining, combat and ship salvaging. Trading is basically buy low, sell high, and keep what you need. Not sure more details are needed, but the three other ways wil get a full section. An extractor, used to get ores & ice. Sensors for ship mining, to look for the asteroid you want. A disposal unit, for unwanted ore & wastes. There is basically two ways to mine: in a station or in a ship. If you just need the basic materials, I strongly suggest that you start with station mining, as it is basically risk-free and cost-free. In Hurles starting station (maybe Black Pit, didn't checked yet) you can get iron, copper, carbon & water without moving from the station. You basically go to the extractor, select the asteroid to mine, click the button and put the result in your vault. I personally don't refine when I mine, as splitting the process is a bit less tedious to me, and allows me to use the 3 extractors from a mining room simultaneously. I don't see any reason to ship-mine for iron, copper, carbon & water when you start: you risk to loose your ship when it is out, Hurles has 3 extractors on hand free to use, and more asteroids than in the classic belts. A - Locate the system you can get the material from (and go to that system & in a belt). B - Locate the asteroid you want in the belt. C - Mine it, and back to b until ship is full or you are bored. After you are in the system and in a belt (grey triangle on your hud), you will see that asteroids are far more sparse that the one sitting around mining stations. And you want to find those with the resource you want, not filling up your ship with only iron. That's where the sensors comes into play. Switch the filter to scan for the materials you want to collect, and engage your sensors. They'll go from seemingly half sized unstable bars to small, more stable ones. When your ship nose will point to an asteroid rich with the material you are looking for, the bars in front of the material will raise. Now the resource is nearly in your pockets (well, carghold). Try to find the direction where the signal is the higher, and, when the asteroid is in excavator range, the signal will turn green. Do not go to a full stop. Try to locate and approach the asteroid, so it won't leave the excavator range while you're running to reach it. The asteroid will have the time for you to leave the seat until you press the "mine" button to leave the excavator range, so having a short distance between your pilot seat and your excavator is a must. You ca also, if you located the very asteroid, go behind it and match its velocity to give you more time to get it. Load yourself with 10 stacks, teleport to station, unload to vault and teleport back to ship. Using the cargo teleporter (direct transfer to vault possible) 8 stacks at a time. Ship salvaging. This one has its own section. Armor generator & nanobots (recommended). A disposal unit, for unwanted scraps & wastes. Mission rewards (money & materials) if the fight was part of the mission. Bounty for each skrill you kill. salvaged scraps, nitrogen oxide & biomatter. I'll start with the passive (no weapon fired) fighting, that can be called free looting. The aim here, is to leave a station defenses do the job, and grab what you can with salvagers. You can start with as few a 1 salvager, but having 8 of them is quite good IMHO. You can take as few risks as "When the station I'm in is under attack i wait for the fight to be finished before unstoring my ship to salvage what I can from where I popped" to having a ship that tanks the incoming fire with its shields while i'm salvaging what station drones are killing. You will get plenty iron, copper & steel scraps, nitrogen oxide and biomatter, but also, if a pirate drone was killed, some brass, silicon and aluminium scraps. I have also seen (never tried) a way to get a few silicon using this : if you can buy the GT hauler and salvage it, you get 250 silicon and the other materials. If you really need the iron, copper & steel that come with it, it may be a good deal, but otherwise, it sounds like a very costly way to get only 250 silicon. To reach that goal both efficiently and safely we have a few things to do. The first one being being able to rift in another system, as you will ultimately want to reach a T1 system. So, your ship will need a T0 rift generator, and some Xanthium to fuel it. Let's begin with the fuel, as having a rift generator without some is useless, adds useless weight to your ship, slowing it down, etc. We want 1.5K xanthium as a start. You can either mine for it, or get it from missions from your starter base. Missions offer the benefit of raising your faction status, and you will need it afterward. If you want to mine some, you will need (check the ingame encyclopedia as it may have changed) berylium, deuterium & nitrogen. All those should be available in your starter system (see Mining section). I would recommend to do both so you can train to combat while missioning (pick those with fuel rewards first) and to mine without having too much invested into your ship. Now that we have the fuel, and a little combat & mining experience, we can move to the next step before mining silicon : automating a bit the mining process. we aim in this step to make an extraction cartridge wich will allow extration automatization, so we won't have to leave the pilot seat for you extractor to work. We will still have to empty it manually for now, but that will limit the asteroid hunt & miss greatly. As you ingame encyclopedia shows you, we will need 10 silicon, silver & gold per cartridge. If you had some silicon in the upward chapters, keep some in your vault for now, we will use it soon. We just want to grab at least 10 silver & 10 gold for now. You will have to select a system (T0 as you can't and don't want to rift to higher tiers for now) with a not-so-bad silver and gold index (I suggest 0.1 at least for both, the higher the better) and with a skrill faction score as low as possible. Make sure you have a disposal unit to get rid of all that unwated ore & water. I recommend to have a combat-ready, mining-ready ship (6 lasers, 3 small shields, 2 loaded ammo loaders, small CPU, 1 extractor, 1 refinery if fuel or anything else lacks, 1 assembly to be able to make ammos, cargoholds, 1 disposal unit, 3 big antenna sensors, 220 m/s speed and 0.4 turning rate at least). Double-check you have more than the double fuel (for cargo weight increase) needed to go to that system, rift to it, grab that silver & gold (more is better), and come back. The next step is to automate extration, get your faction standing up to 1K, and make some fuel again. Automating the extractor is easy if you have 10 silicon on hands : install a 3D printer in your ship, fill it with at least 10 silicon, 10 silver and 10 gold and program it for an extractor cartridge. Go to you extractor, insert the cartridge (put it in your hands and look at the cartridge slot to be able to install it), access the upgrade to program the extractor priority list. Warning : the cartridge will loose durability when turned on, even without extracting, so don't forget to turn it off whever you don't plan on using it. If you weren't able to get the few 10 silicon before, get your fuel & faction stading anyway, you'll automate when you'll get some. Wether you were able to automate (recommended) or not your extraction, you got your faction standing up to 1K and got some fuel. Head to the faction stand on your starting base, and buy a T1 rift cartridge from them. Install it like you would have with the extractor cartridge. Select your system (same cautions to take), and rift. If you weren't able to get some silicon beforehand and the T1 system has a station that offer missions, check if there is one you can do without too much troubles that gives silicon as a reward, or grab a first silicon roid to refine and print your extractor cartridge.